Compete. Connect. Collaborate. Control. How to Have it All. COMPETE. Servicers must find ways to reduce costs, minimize risk and improve operational efficiencies in order to remain competitive. The pressure is on to implement a flexible, interactive, nimble workflow solution to handle these critical business demands. CONNECT. For years, organizations have purchased point solutions to solve specific points of pain such as compliance and customer engagement. Workflow means you don't have to choose! Connect your point solutions, connect your business partners and connect with you customers. Most importantly, connect your processes. COLLABORATE. Bring the customer in. Make it easy to work with your organization. Bring your business partners in and lower the costs of doing business with them. Use workflow to increase customer engagement and automatically distribute requests for information in a personalized way. CONTROL. Use workflow and business rules to control quality, mitigate risk and improve compliance. Repeatable, standardized processes that simplify the complexities of your business. HAVE IT ALL. The power to modernize while harmonizing the interactive workflows results in increasing efficiencies and decreasing costs. You can have it all in one platform. 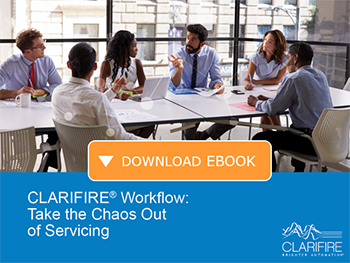 Download our "CLARIFIRE WORKFLOW: Take the Chaos Out of Servicing" eBook! Learn how using CLARIFIRE workflow automation as your loan servicing software enables your company to minimize risk and remain competitive — while eliminating the chaos. View our "CLARIFIRE Workflow Automation: Delivering Innovation for Service Providers" Infographic.